Join us for a fun, energetic, open-gym format class to get the Little Tykes moving! While our preschool students do practice and perform gymnastics skills, this program is also a general movement education program. Students will learn different body positions such as a bridge and straddle. Students will participate in a wide variety of movement activities such as climbing, sliding, running, skipping, hopping, balancing, crawling, and swinging. Students will learn basic tumbling skills such as forward and backward rolls, handstands, and cartwheels. Children in the preschool program are placed in their class according to their age. Baby Class (ages 1-2) Fun parent interaction with children exploring the developmental progression of simple concepts. 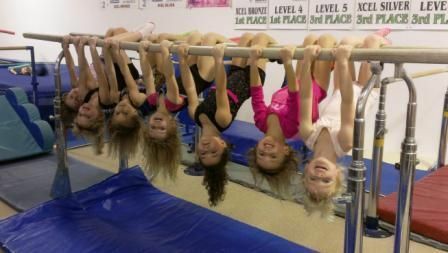 Child (ages 3 1/2-4) A comprehensive, well-planned gymnastically oriented program. Our curriculum coordinates skills and activities with the child's appropriate developmental stage. Child (ages 4 1/2-6) Structured, progressive, and unique lesson plans for children to grow through. These classes are designed to be for students ages six and up. Athletes will learn proficiency in the skills of handstands, cartwheels, and forward and backward rolls. Athletes will also be introduced to the vault, uneven bars, balance beam, and trampoline. All gymnasts follow a skill progression chart for each event, working on appropriate drills for their skill level. Our program includes lesson plans on all gymnastic apparatus according to the USAG Jr. Olympic levels. Now introducing a class to help prepare gymnasts for their high school gymnastics team. MGA is the proud home of the Highland High School Gymnastics Team and is the training facility for the Medina High School Team. Our flexible program allows gymnasts to decide their individual level of participation--girls may choose to compete and train for high school only, high school and Xcel, or high school and Junior Olympic Program. We believe offering our gymnasts several choices will help them shine and reach their full potential as athletes. Check out our Open Gym classes for opportunities to work on the tumbling skills necessary for cheerleading and gymnastics floor routines. Some of the fundamentals you can work on are cartwheels, round offs, back handsprings, walkovers, and many other floor skills. Open Gym is the perfect opportunity to create your own tumbling class! Private Tumbling Classes are also available--call our office for more information. Children participating in the team programs have been selected from our pre-school and recreational programs as having strong potential for success in the sport of gymnastics because of above average physical attributes in the areas of strength, flexibility, and coordination, as well as mental toughness and a positive attitude.